Many pilots chose our TONKA2 Miniwing. The 30th edition of the Red Bull Dolomitenmann was a success also for skywalk paragliders. X-ALPS competitor and paraglide pro Aaron Durogati got 1st place on our TONKA2 Miniwing. 5-times X-ALPS winner and 2017 skywalk X-ALPS athlete Chrigel Maurer saved rank 2 in the paraglide single ranking. Markus Prantl won the team ranking with his « Pure Encapsulations » team and got 6th place in the single ranking. All named pilots flew our Miniwing TONKA2. At exactly 10 o’clock fell the starting shot for the 30th Red Bull Dolomitenmann. 130 teams were making their way to the summit of the Kühbodentörl . After a courageous start from Toni Palzer (GER), Philip Götsch of “Pure Encapsulations” quickly took the lead and led the group of top runners for a long time. At refreshing area 4 Mamu Petro (ERI) started to overtake. Petro from Team “Kleine Zeitung Panaceo Martini Sportswear” finished the race with a fabulous time of 1:22:03 before Philip Götsch in 1:22:39 and Toni Palzer from the team “Red Bull”. Andreas Goldberger from the team Wings for Life was able to realize his personal goal at his last start. Due to the unstable weather conditions the start of the paragliders had to be transferred from the Kuhbodentörl to the Moosalm. No easy task, but Markus Prantl from the “Pure Encapsulations” arrived at the lead position in the stadium. 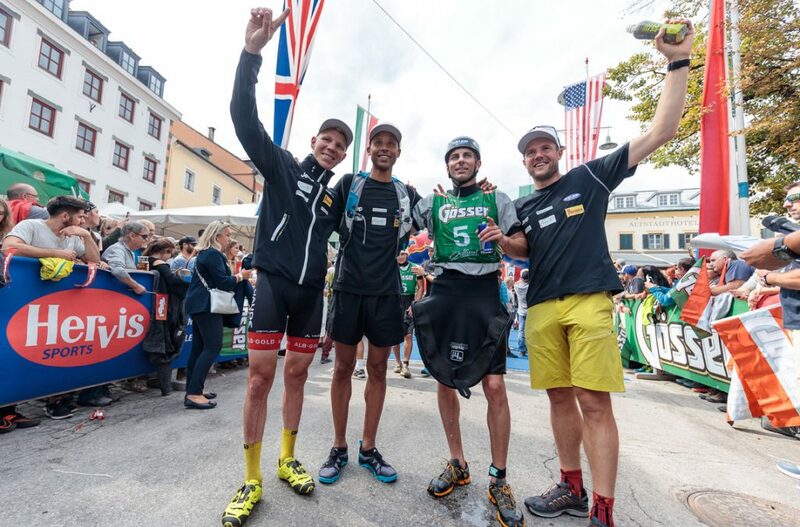 Prantl handed over his teampartner Tony Longo (ITA) in a head-to-head race, followed closely by Lorenz Peer “Kleine Zeitung Panaceo Martini Sportswear” and Red Bull X-Alps starter Paul Guschlbauer for the team “Red Bull”. The mountain bikers left the Dolomitenstadium in direction of Hochstein. Up to the Hochsteinkreuz, they had to climb 1500 meters altitude this year – carrying passes included. While Tony Longo and Kristian Hynek (CZE) had a peronal “fight”in the leading positions. There were a few shifts in the other top field. Daniel Geismayr of “Kolland Topsport Professional” and Samuele Porro (ITA) “Kolland Topsport International” were able to work a few places forward. For the canoeists had to pass the 7-meters jump into the floods of the Drava. Gerhard Schmid from “Pure Encapsulations” made the first jump in the water. He was able to convince with a top performance and kept a distance from Manuel Filzwieser. He lost his second place to Ninja Warrior Herwig Natmessnig from “Kolland Topsport Professional”. It was an ecxiting race until the teams reached the finish line.